When a man and a woman meet in a hospital, love blooms; or does it falter? Only their nurse and doctor know for sure, but they’re too self-absorbed and ridiculous to tell us.Will our lovers see spring blossom together, or will the weight of an unwieldy world fracture them forever? The Prologue doesn’t know, and The Epilogue isn’t telling. 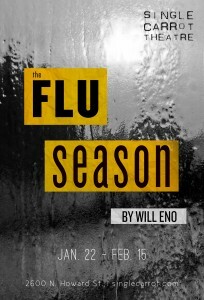 WYPR previews the show HERE with interviews with cast and director.